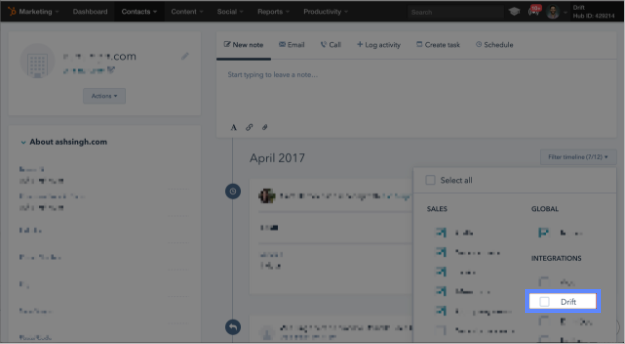 You can track certain events in Drift and add them to your HubSpot's contact timeline! You can then create lists based on these events and be able to retarget your site visitors who have chatted with you using Drift. What events can be tracked? What if my Drift events are not showing in HubSpot? Not seeing the events in the timeline? First, make sure you have selected the Drift checkbox to filter for seeing the Drift events on the timeline! Second, check your sync settings in your HubSpot App Settings within Drift. Currently, if you have selected the checkbox to prevent contact creation until conversation is Closed, then this may be why Drift hasn't sent events into your HubSpot. If you or your teammates have not Closed the Drift conversation within 7 days of the contact creation, then Drift the event information for that contact will no longer be sent into HubSpot. For example, if you Create Contact only on Conversation Closed rather than leaving that setting unchecked, have a conversation with a new contact who books a meeting, and then leave it open for 8 days before Closing it, then you will not see the Meeting Booked event for that contact on their timeline in HubSpot.